Plants and their pollinators began evolving their intricate dance of codependency over 100 million years ago with the origin of the flowering plants (angiosperms). They fine-tuned it during the Cenozoic era (beginning 65 million years ago) as flowering plants began to dominate all the world’s living landscapes. These millions of years of plant-pollinator coevolution have produced a world in which flowers have their anatomy and scents finely tuned to their pollinator partners. In exchange for pollination services, flowers provide food (nectar, pollen), shelter, and chemicals used by insects to produce such things as pheromones (chemicals produced by animals and released into the environment to stimulate a behavioural response from another animal). The relationship between flowering plants and their pollinators is so intimate that, should pollinator populations decline (or worse yet, go extinct), the impact on their plant associates would be immediate and profound. Because pollinators are species upon which the lives of so many other species depend, they are regarded as “keystone species”. Pollinators are thus essential to the stability of the global ecosystem itself. In fact, without pollinators, life on planet Earth would be very different. Not only are our native plants dependent upon pollinators for their continued existence, but so are our crops. Eighty percent of the world’s crop species, including food, beverage, medicine, dye, and fiber crops, rely on animal pollinators. The critical importance of pollination has been recognized since humans first gave up nomadic lifestyles. That great symbol of human-pollinator partnering, beekeeping, began long ago, at least by 600 B.C. in the Nile Valley and probably well before that. The first beekeepers were most likely Egyptians who floated hives up and down the Nile to provide pollination services to floodplain farmers while simultaneously producing a honey crop. Domestic honey bees (Apis mellifera), introduced to North America from Europe in the mid-1600s, now play a role in pollinating 80 percent of the crop varieties grown in the United States and a significant percentage in Canada. However, the story is complex. Because European honey bees have been introduced worldwide they now compete with native bees (and other native insects) around the world, and it is now virtually impossible to find an area free of managed or feral honey bees. Honey bees out-compete native insect pollinators by overwhelming them with their sheer numbers and superior ability to detect and direct one another to pollen and nectar sources. Further complicating the story, at the same time that the almost the whole world has become dependent on domestic honey bees, their populations are declining in many parts of the world, including Canada, due to exotic (introduced) bee parasites (e.g., mites, beetles), loss of habitat and, use of pesticides, and the invasion by highly aggressive Africanized bees (A. mellifera scutellata) into the United States (since 1990). 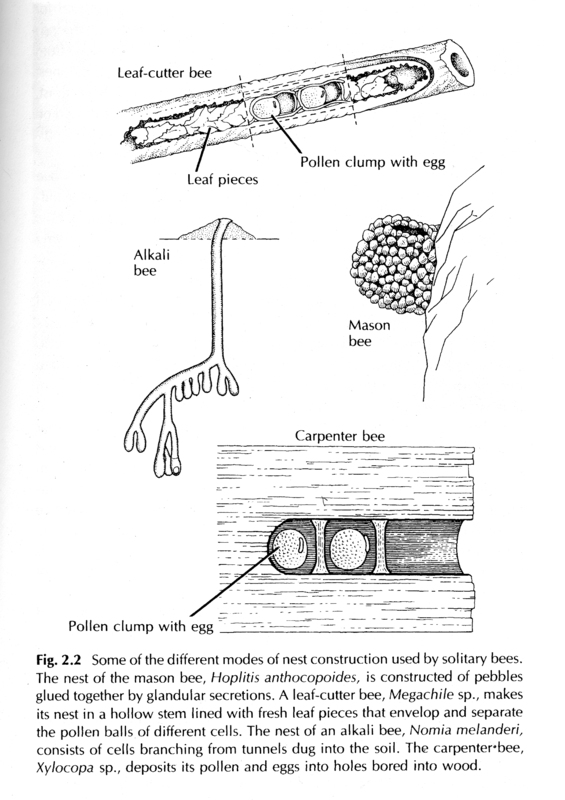 The aggressive Africanized bees out-compete the European honey bees but do not pollinate all the same plants and crops. The direct competition between European and Africanized honey bees with native species is reducing the numbers of native pollinators, and it is adding to the pollination crisis that the world faces today. And most recently we have colony collapse disorder, which does not seem to be impacting Canadian beekeepers, at least not yet. Like many other animals on Earth, pollinators today face growing threats of extinction. Disruption of habitat, widespread and often inappropriate use of pesticides, and the development of certain genetically engineered plants further add to the crisis, as pollinating insects are locally extirpated and native plant and domestic crop reproduction and fruit production plummet. It is suspected that many thousands of pollinator species have become extinct over the past century as a result of worldwide, rampant land-use change and deforestation. With accelerating global biodiversity losses, estimates of the number of insect species alone that will go extinct by the year 2050 range into the hundreds of thousands. The impact on native plants and on crops cannot be predicted in detail, but will surely be enormous. When we think of bees, we tend to think of honey, wax candles, venomous stings, traditional and reinvented apitherapies. As of late, we ponder more seriously their declining numbers and mass disappearing acts, and how we ultimately rely on them for much of our food, most of which is true and which is relevant — regarding the world of honeybees. What most of us aren’t aware of are the 19,000 (and counting) diverse species of bees world-wide (most of which are not honeybees; hundreds of which are found in Canada), their ancient associations with plants and ecosystems which make up the world as we know it, and their place in the bigger picture of the earth’s pollination story. This story includes moths, butterflies, beetles, birds, wasps, bats and even a few larger mammals. It involves “pollination corridors”— routes which maintain migrating pollinators like hummingbirds and Monarch butterflies — routes which can extend thousands of miles, from the Arctic to Mexico. It encompasses a wide variety of survival strategies on the parts of pollinating animals and the plants on which they depend, strategies honed through the ages in an ever-evolving dance of adaptation through time and change, including change resulting from human presence. It involves genetic diversity, that essential ingredient to the survival of all living things on Earth, including us. So, who are these indigenous bees? Most of us know so little about them: where they live, when they live and when they’re active, what they look like, how they nest, what they eat, where they forage, how they navigate, how they communicate, what they pollinate. We don’t even really know if or how they positively affect – or might affect – our capacity to produce food sustainably, given our penchant for monocultural practices (including the pollinators we use). It is known that there are at least some 800 species of indigenous bees in Canada, perhaps 150 of which still exist in the Greater Toronto Area. Some live in small groups, most live entirely alone, in their very own apartments. And somehow they manage to make it through the Winter. Let’s meet them, up close and personal. Wasps are largely carnivores. 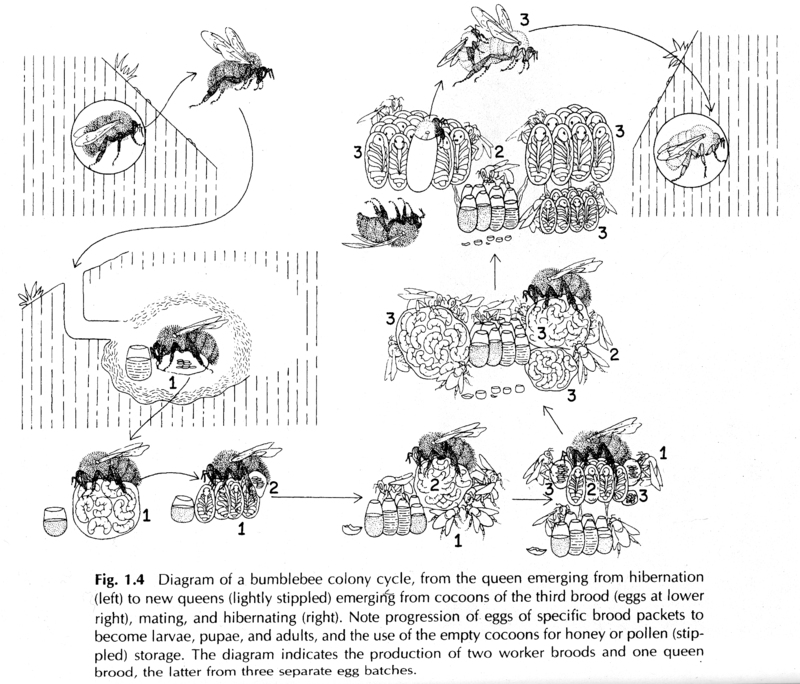 Bees,which evolved from wasps, are believed to have made the scene about the same time as flowering plants. Wasps also pollinate, though most do to a much lesser extent than do bees. Like bees, many species of wasps are solitary (do not live in hives), living here and there in bramble and earth.